Haworth Village will go Spooky on 25th - 26th October 2014. Spooky Goings On In Haworth! 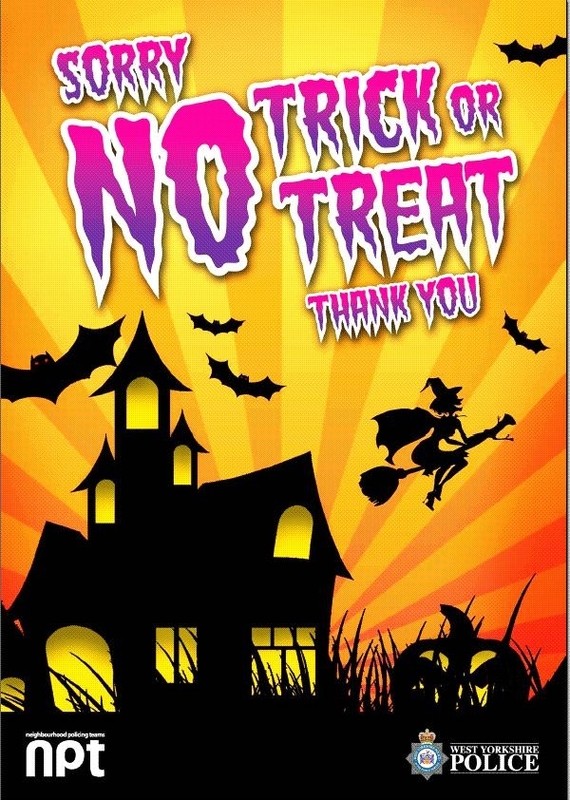 Bingley NPT appreciate that not everyone wants a visit from a Witch or Goblin on Halloween. If you would prefer not receive a visit why not print out a copy of the poster (click on thumbnail for bigger image) and place it on your door. Please encourage your children to respect householders wishes and ask them not to knock on doors displaying this or similar posters. Haworth Village Association reserves the right to change/alter dates/ performers/events without prior notice although every endeavour will be made to keep to the published programmes. Halloween or eve of All Souls Day can be traced back to Celtic times. October 31st marked the Celtic New Year and it was celebrated with the festival of Samhain. It was believed that the demons and spirits of the dead would return and possess the living. To prevent being possessed people lit bonfires to ward the spirits off.